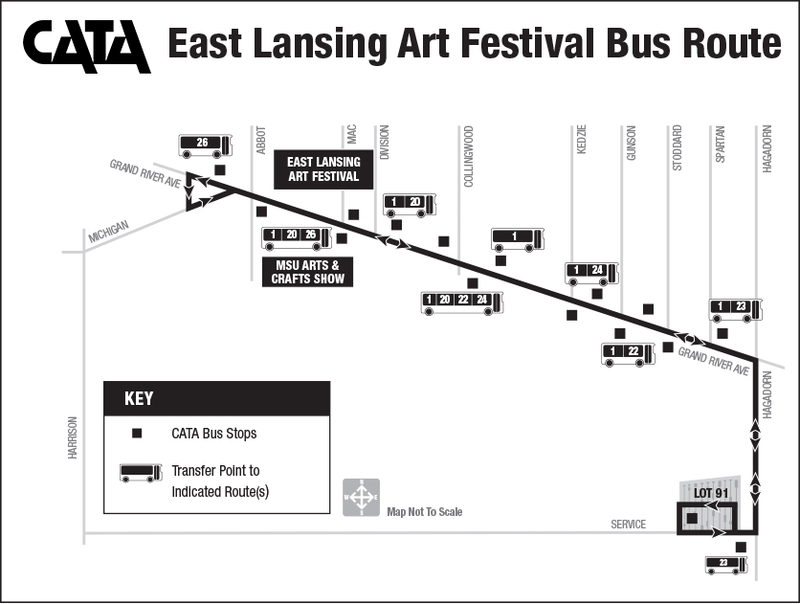 CATA is proud to be a sponsor of the East Lansing Art Festival and encourage all patrons to use CATA services provided for their convenience and enjoyment. The CATA Shuttle Bus is an easy and convenient way to get to the festival! The payment options for round trip service between Michigan State University Lot #91 (Service Road and Hagadorn Road) and Grand River Avenue are:. Children 42” or under ride for free. All CATA buses have bike racks and wheelchair ramps/lifts for accessibility. Service animals are welcome. In addition to the festival bus route, Route 1 and Routes 20-26 travel to East Lansing during the festival for a convenient and affordable transportation option. For more information, contact CATA at info@cata.org or 517.394.1000. City parking ramps are open during the festival. The location of each parking ramp is indicated on the booth map. Ride your Bike the East Lansing Art Festival and enjoy free Valet Bike Parking provided by Mid-MEAC. Valet Bike Parking is located on Abbot Rd next to Dublin Square. The payment options for round and River Avenue are:.